Heat oven to 350°F. Spray 13x9-inch (3-quart) glass baking dish with cooking spray. In 10-inch skillet, heat sesame oil and butter over medium heat. Add pork; cook 8 to 10 minutes or until browned. Add green onion whites, gingerroot and garlic; cook 1 to 2 minutes longer or until onion softens. Stir in tomato sauce, fish sauce and chile garlic sauce; heat just to simmering. In medium bowl, mix ricotta cheese, 1 cup of the Parmesan cheese and the coconut milk. Place 8 wonton wrappers, overlapping slightly, in bottom of baking dish. Top with another layer of 8 wonton wrappers. Spread one-third of the cheese mixture (about 3/4 cup) over the wrappers. Spread one-third of the pork mixture (about 1 cup) over the cheese mixture. Repeat twice. Top with remaining Parmesan cheese. 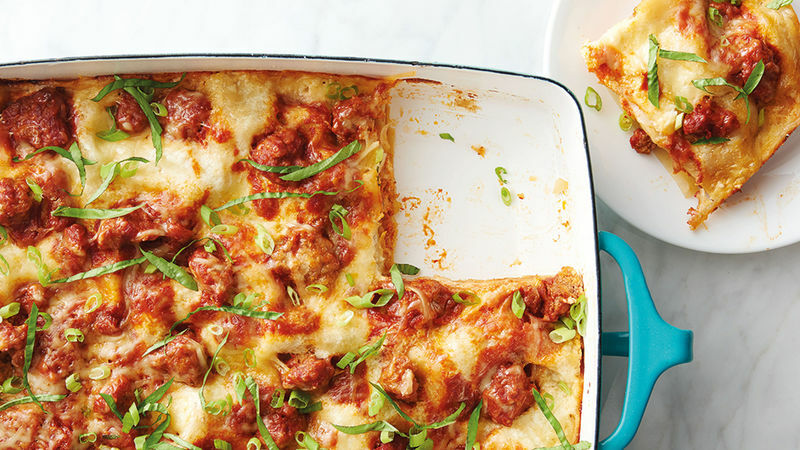 If making ahead to bake and serve at a later date: Line 13x9-inch (3-quart) glass baking dish with 2 layers of plastic wrap, leaving enough overhang to completely enclose the assembled lasagna. Cool pork mixture completely, covered, 30 to 45 minutes in refrigerator before assembling lasagna. Assemble lasagna in dish; cover with another layer of plastic wrap. Freeze unbaked lasagna about 8 hours or until completely frozen. Transfer to labeled 2-gallon resealable freezer plastic bag. Remove air; seal and freeze up to three months. Reserve green onion greens for another use. To bake: Spray 13x9-inch (3-quart) glass baking dish with cooking spray. Remove plastic wrap from lasagna; transfer to baking dish. Cover tightly with foil; thaw completely in refrigerator, 12 to 24 hours. Heat oven to 350°F. Bake, covered, 45 minutes. Uncover; bake 10 to 15 minutes longer or until cheese begins to brown and casserole is hot and bubbling on edges (165°F in center). Let stand 5 minutes before cutting. Top with basil. To easily spread cheese mixture, spoon mixture over center of wonton wrappers, and spread toward edges with a small plastic spatula. Can’t find Thai basil leaves? Regular basil or cilantro are great substitutes.